Somehow I let almost two weeks to by since my last post. Definitely a sign that it’s planting time. And while I may not be doing the planting every day, my workload increases with increased laundry needs and picking up some of the things my husband would help with when he was working shorter days (like cooking….which takes me forever). I’ll try to do better with my posting. I promise. Last week, my husband and father-in-law planted sweet corn. (Hooray!) As long as everything goes well, it should be ready around the middle of July. (What a long wait!) However, it’s still pretty cold outside for sweet corn. 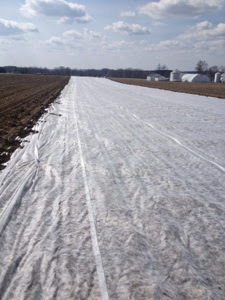 To get sweet corn in the ground so early, it must be covered to stay warm and protect it, you know, from things like the other night’s snow. No sign of delicious sweet corn yet, but it’s in there! 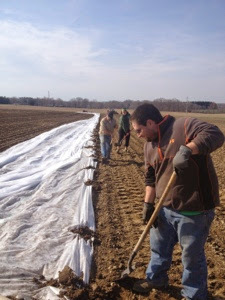 We started with two large rolls of Covertan, a very thin, breathable fabric that helps maintain a warm atmosphere to allow seed to germinate but also allows water to pass through, a benefit that plastic doesn’t offer. Unfortunately I didn’t get a picture of the rolls (large, but since the fabric is so thin, certainly not as large as you’d think for a 500-foot roll). 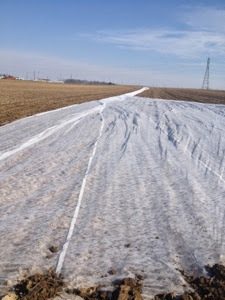 Nor did I get a picture of the process we used to unroll them since I was hard at work securing one side of the fabric by shoveling soil at intervals to prevent the fabric from flying across the field in the windy morning (a task that sounds way easier than really is to accomplish!). 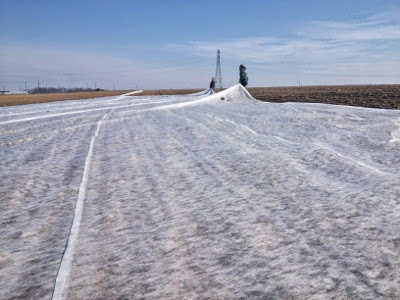 After the cover was unrolled and generally secured, we went back down the row and insured that only the very edge layer was under the dirt. 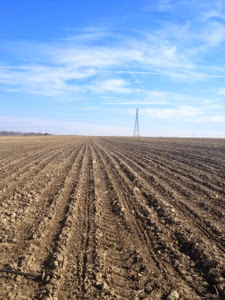 My job was to ensure it was straight (well, as straight as the row of corn) and hold while it was re-secured with dirt by my husband. His father and sister were right behind, helping to fill in the gaps so that the edge was extremely secure. 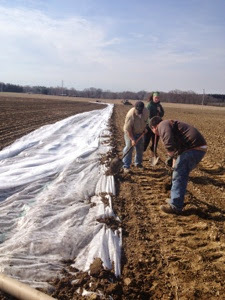 The next step was pulling the stacked layers across the field to cover the entire planting since the fabric was folded onto itself. 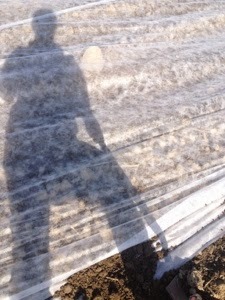 Once the fabric was stretched across the field, it was time to secure it again. This time I shoveled while someone else lined up the cover. Here you can see how thin the fabric is. Yes, that’s a large rock by my shoulder. Then we did it all again with another 500-foot roll. 1,000 foot section of sweet corn covered. The corn here is about enough to satisfy the demand of the market for about a week. So we’ll be doing this again very soon!